I love to make new and different things when we go to parties at my in-laws. The first time I took lemon squares I did not bring any home. They are the most requested item when I am in charge of bringing dessert. I have even given them to my father-in-law for his birthday, as his gift so he can eat them all himself and not feel too guilty about not sharing. We are believers of strong flavors, these squares do not taste “yellow” like they might be lemon, they taste like lemon. The secret is lots of lemon zest, I add more than the original recipe calls to make sure there is a strong lemon flavor. It pays off, the shortbread crust with the custard like lemon topping is always delicious and well enjoyed. *I usually use two small lemons, the juice is usually pretty spot on, and I just zest them both and use it all. Combine 2 cups flour, butter, powdered sugar and salt, mixing well. Pat into a 9″ x 13″ x 2″ pan. Bake at 350 degrees F for 15 minutes, or until golden brown. Do not over bake. Meanwhile prepare filling by mixing together 1/4 cup flour, sugar, eggs, lemon juice and zest. Pour over baked crust. Return to oven and bake at 350 degrees F for 25 minutes. Remove pan from oven and sprinkle with powdered sugar. When cool, cut into squares. Hello Mary and girls! This recipe looks scrumptious! I pinned it and I’m hoping to make it this weekend. I was wondering if I can make this a day ahead? Thanks for sharing. Absolutely you can make them the day before. Just don’t cut them until the day you want to serve them or you won’t have any left. Come see us again. I love lemon squares and these look awesome. Pinning. These Lemon squares look delicious. I am a huge fan of anything lemon. Pinned!!! I would love it if you stop by The Southern Special and link this recipe up. http://www.thedecoratoraholic.com/ Thanks for sharing your recipe. 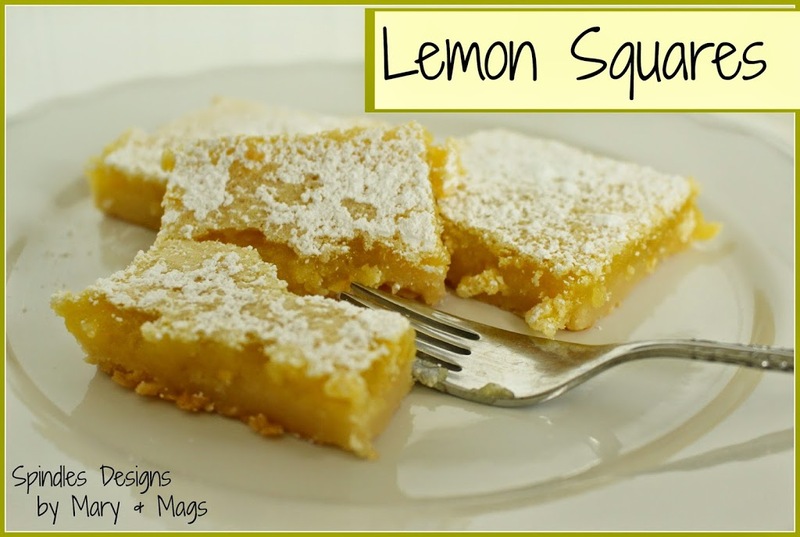 I love lemon squares! Thank you so much for linking up at Tasty Tuesday! Your recipe has been pinned to the Tasty Tuesday Pinterest board! Please join us again this week!